The Handi Feet Conversion kit provides everything necessary to convert any older HQ quilting machine to be able to use the new interchangeable Handi Feet. Also included in the conversion kit are the Ruler Handi Foot and the Open-toe Handi Foot. 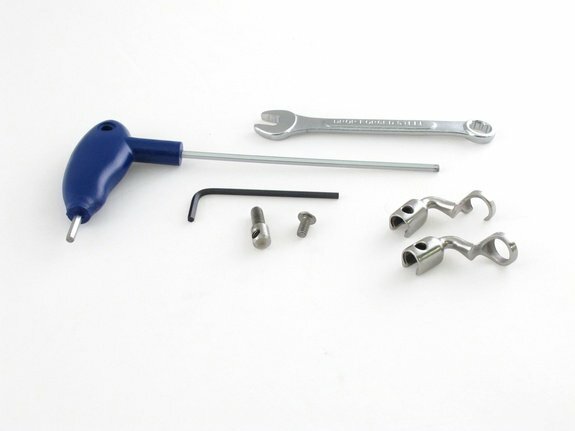 **NOTE** If your machine has the old style foot with a long shank that screws in to your machine, you will need this conversion kit to be able to use the different Handi Feet. If your machine has the feet with the shorter shank with U-shape at the top, you do not need the conversion kit to be able to use the different Handi Feet.